Turn a nostalgic, old-fashioned bubble gum machine into a tasty and Bubble-icious treat for someone special! 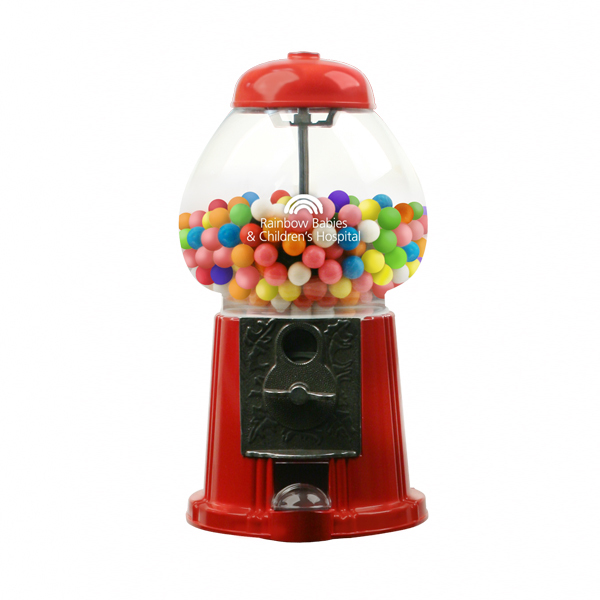 Our new Gumball Machine doubles their fun - they save money from their coin deposits and get a tasty treat in return! The decorative coin slot accepts pennies, nickles, dimes and quarters. Bottom screws out to retrieve used coins. Reminiscent of days gone by, combined with childhood fun our new Gumball Machine is quality constructed of bright red die-cast metal with glass globe and stands an impressive 11 high. *Fillers available but not included in price of machine. Please call for information. 5.5 x 6.25 x 11 inches OR 13.97 x 15.88 x 27.94 cm. 2 x 1.25 inches OR 5.08 x 3.18 cm.